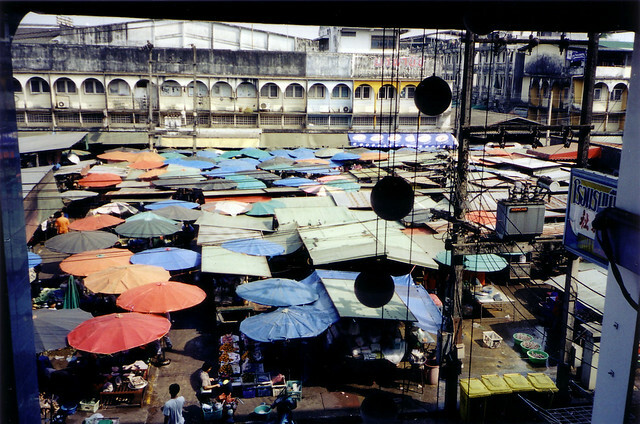 I was scrummaging around my hard drive and came across some scans I had done of film prints of Cambodia and Thailand from January 2004 but hadn’t cleaned up and catalogued. My digital camera had broken while at the Angkor temples in Cambodia but luckily I had my mini film camera as backup. 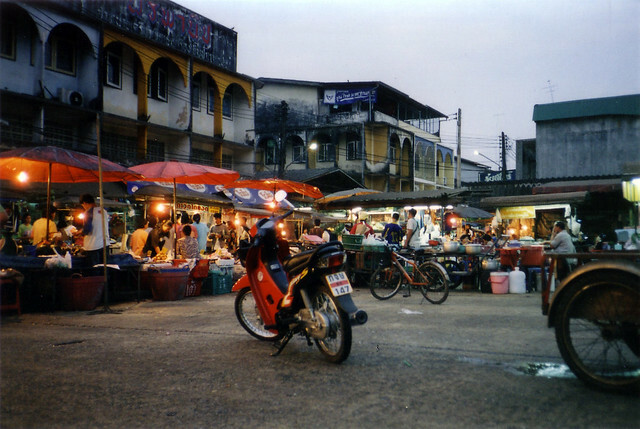 While relaxing for a couple of days in the small Thai town of Trat near the Cambodian border (to recover from the intensity of Cambodia and the gruelling road trips in and out), I managed to get some shots of the amazing transformations of the town’s market square through the course of a day. 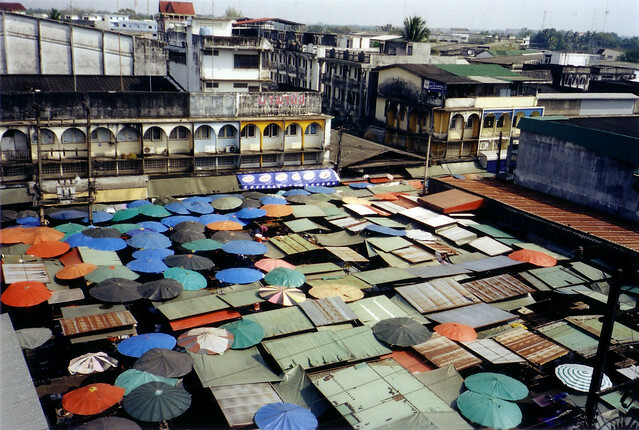 In the morning there’s a fairly intense wet market (for fruit, vegetables and meat), with temporary stalls with all kinds of umbrellas and canopies for protection from sun and rain. 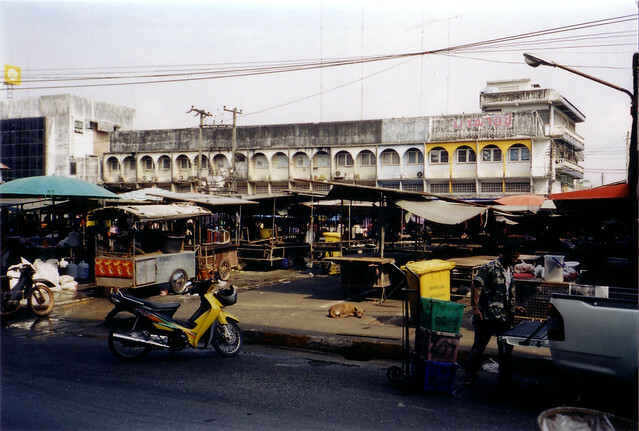 Later in the day, the wet market closes and disappears and the market square gets cleaned up and sits there empty. 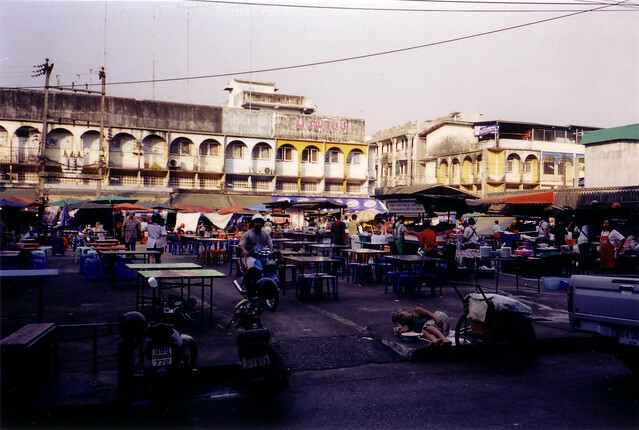 Then in late afternoon, the night market starts to set up with food stalls with patio furniture seating, some fruits, vegetables and dry goods. 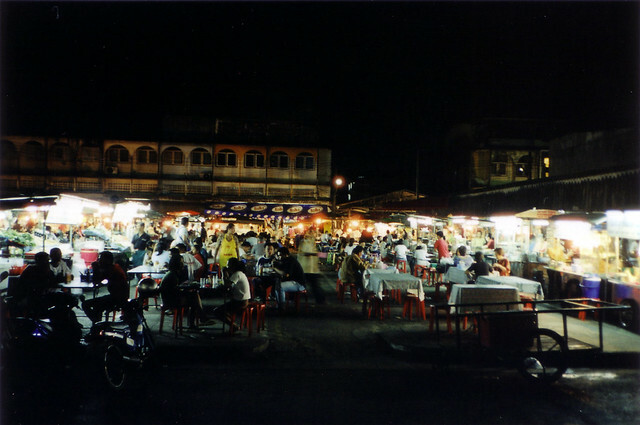 The night market runs right through the evening with a great variety of dishes available from a multitude of stalls and a fantastic outdoor eating and drinking atmosphere. While to a casual observer it seems a bit chaotic, it’s clearly highly organized and well managed – there are even painted lines on the square surface organizing the setup. 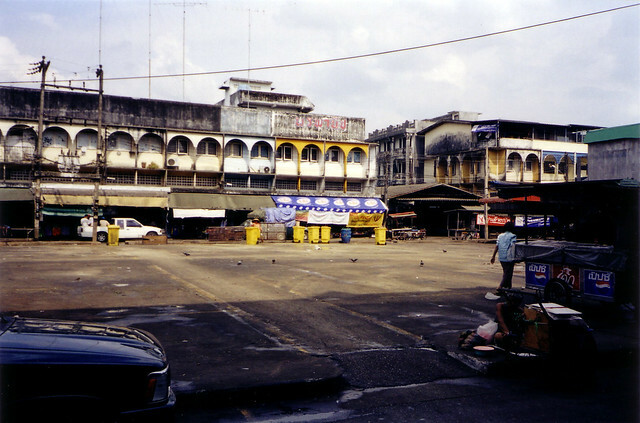 What’s most striking is how this compares to the ridiculous way some Western public squares such as Dundas Square or Nathan Phillips Square are managed, with corporate events and advertising, overbearing security, and any lively activities like what takes place in Trat every day confined to strict and infrequently programmed “events”.